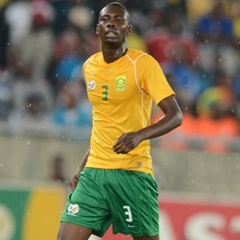 Mbombela - Bafana Bafana defender Eric Mathoho believes his team-mates stood their ground against the Nigerians in their friendly encounter over the weekend. The two bitter rivals played to a 1-all draw at the Mbombela Stadium in Mpumalanga on Sunday with Ahmed Musa and Bongani Zungu scoring for both sides in the closing stages of the entertaining clash. Considering Bafana’s history against the former African champions, “Tower” said a draw was a fair result for Shakes Mashaba’s team on the day. “Credit must go to the coach and all my team-mates,” said Mathoho. “We played very well as a team and the way we played, it was not suitable for us to lose the game. Mathoho, 25, had a stellar game at the back, earning himself the man-of-the match accolade and pocketing R10 000 courtesy of sponsors Absa.